Synopsis: A fallen, fighter pilot awakes in the desert. She soon realizes she is not alone, or is she? CEM: The inspiration for One-Armed Rabbit came from wanting to create my own content and to be able to play a role that I could choose. I wanted to show off my combat skills and my acting skills, but I am a comedian, so I knew I wanted it to be funny and eccentric. 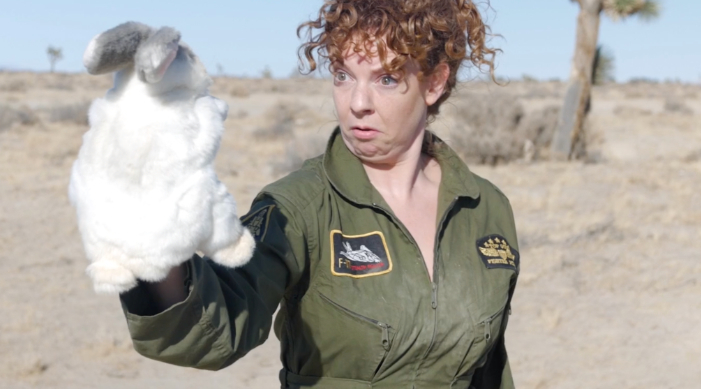 My father had randomly given me a rabbit puppet for Christmas that year, so I thought why not combine the two and create a puppet, combat short. I’m a huge horror fan, even more so than comedy and was heavily influenced by Ash in Evil Dead, wanting to create an awesome, horror-comedy fight scene with myself. My sense of humor comes from Monty Python and Mel Brooks. And of course puppets, from Jim Henson & Co.
CEM: In very early of January 2018 I came up with the idea to make a “video” where I could show off my combat skills. I wrote the script in probably an hour and called the people i needed to make it happen and then on Feb.25th 2018 we were shooting. It honestly was a very fast process for me and it was all because I made a deal with myself to Just Do It! CEM: For me, nothing. I could, however see MANY challenges with creating a feature. We shot it and we edited it, and I let it be as long as it wanted to be and it came out the perfect length. CEM: The most challenging aspect of our production was location. I needed complete isolation, with no signs of man made anything, and I needed to find it for free. I asked around like crazy and scouted 3 or 4 places on my own, until finally a friend of mine mentioned the location where they shot the church scene in Kill Bill. It ended up being only 45 minutes away from L.A. and it was barren. Awesome! But what does the barren desert lead to? Extreme wind! I watch a LOT of indie films. The number one thing that I feel makes or breaks them is the sound, and the amount of wind I experienced when I scouted the location was unbearable. I knew there wasn’t a lot of dialogue in my film so if I was going to have to do ADR, I was willing to risk it for the location. However, we totally lucked out and got one of the least windy days we could hope for. The sound isn’t perfect but I couldn’t have asked for more for my first film. CEM: I don’t want to sound like a Nike commercial… again. But, JUST DO IT! Don’t sit around and think about it and psych yourself out of it because it may cost too much money, or no one will help you, or they will think your idea is lame. You have to bite the bullet and GO! The only way to be a producer is to produce! You have to START somewhere. And you will feel amazing when its all done!